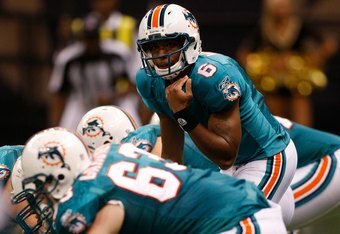 By now,Â you’ve probably heard that much-maligned Dolphins quarterback Pat White has been shown his walking papers after one disastrous season in which heÂ became just the fourth QB to not complete a single pass with at least five attempts since the 1970 AFL-NFLÂ merger.Â Â It’s hard to argue that it was theÂ wrong decision, especially with three better-qualified players ahead of him on the depth chart, but I’mÂ a little dismayed by how the situation was handled by the coaching staff. The Dolphins never gave White much of a chance to succeed.Â During the regular season, he was insertedÂ into theÂ occasionalÂ “Wildcat” formation in which he could never fully show what he had to offer aside from scrambling on the ground.Â In the final game, he was thrown into the fire against a stout Pittsburgh Steelers defense in the thick of the Playoff hunt.Â And then,Â in the 2010 preseason, White took nine total snaps (none in the fourth game), kneeling down three times and throwing (and completing!) four short passes in garbage time. It’s clear that the Dolphins front office was convinced that White wasn’tÂ part of the team’s future plans before the preseason started and didn’t bother to give him an extended look or attempt to increase his trade value for QB-needy teams.Â Â And that’s the part that I’ll never understand.Â The Dolphins are hardly the first team to give up on an early-round draft pick — hell, the Arizona Cardinals released Matt Leinart, the 10th overall selection in 2006 — but the fact that White wasn’t on the field forÂ even a single quarterÂ at the expense of injury-prone veteran Chad Pennington, who hardly needed the extra work, or given the opportunity to battle Tyler Thigpen for the third QB spot doesn’t make a lot of sense. Of course, White isn’t without fault himself.Â There have been indications that his heart wasn’t fully into football after he took a vicious hit that knocked him unconsciousÂ duringÂ last year’sÂ finale.Â Despite possessing the quickness (4.44 in the 40-yard dash at the NFLÂ combine)Â and shiftiness that would make him well-suited to play part-time wide receiver, a laÂ Brad SmithÂ and Joshua Cribbs,Â White refused to switch positions and indicated that he’d rather play baseball.Â Those aren’t exactly the kind of words that management wants to hear out of players on the roster bubble. Be that as it may, White is gone and somewhat surprisingly, wasn’t claimed off waivers despite having most of his 2010 salary paid by the Dolphins.Â I askedÂ Sun-Sentinel reporter Omar Kelly to do some NFL Betting on where White will end up — the CFL, the New England Patriots, or the New York Yankees.Â KellyÂ didn’t even rule out a full retirement from football to be a “regular Joe” in White’s hometown. *Did the Dolphins think they could save someÂ money by releasing TE David Martin and then re-signing him after the first week?Â It’s hard to believe Miami was prepared to rely on John Nalbone, whoÂ entered training camp fourth on the depth chart and didn’t blow anyone away during preseason, in its two tight end packages.Â Martin ended up signing with the Buffalo Bills, who quite coincidentally, I’m sure, happen to play the Dolphins in Week 1.Â The Dolphins couldÂ quickly end upÂ regretting their decision. *In a less surprising move, last year’s third-round pick, WR Patrick Turner, was released over the weekend and signed with the division-rival New York Jets.Â Â Undrafted rookies Marlon Moore and Roberto Wallace must have extremely impressive during practiceÂ for the team to keep them at Turner’s expense, because there isn’t a glaring difference in the preseason numbers. Turner could revive his career with the Jets while playing alongside his former USC QB Mark Sanchez, but chances are slim after he couldn’t get on the fieldÂ last season and was beaten out by a pair of undrafted rookies in camp. 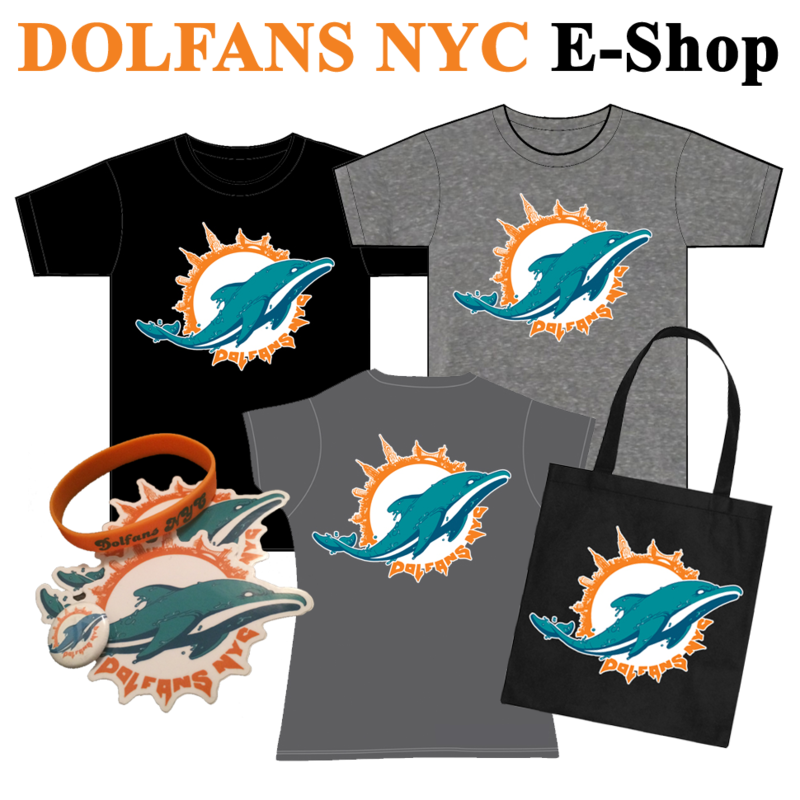 In 2008, with Chad Pennington at quarterback, the Dolphins’ two primary Tight Ends, Anthony Fasano and David Martin, caught a combined 65 passes for 904 yards and 10 touchdowns — half of the team’s total receiving TDs. In 2009, Martin missed the entire season with a knee injury, and Fasano and backup Joey Haynos had 50 receptions for just 504 yards and four TDs between them. WillÂ any ofÂ the Dolphins Tight Ends regain fantasy relevance with Chad Henne under center, or is no player worth a roster spot? Anthony Fasano, TEÂ – Fasano’s drop in production last season was largely due to a different role in the offense, as he was asked to provide more pass protection at the expense of running routes.Â While he wasÂ the second-bestÂ run-blocker in the league, his yards per catch dropped from 13.4 to 10.9,Â heÂ had onlyÂ two scores a year after catching seven, and he led all TEs in fumbles (3), including two in the season opener. Ah, memories. Fasano runs into the end zone in a 38-13 Dolphins victory over the New England Patriots in Foxborough on Sept. 21, 2008. Although he doesn’t possess theÂ downfield receiving ability of the elite TEs, with anÂ improved offensive line and the addition of star wide receiver Brandon Marshall, Fasano should see more opportunities to work the middle of the field and get open in the end zone.Â He’s being drafted in only 2.7% of ESPN leagues as the 25th playerÂ atÂ his position, but makes for a solid second TE who should be in for a niceÂ bounce-back season in 2010. Joey Haynos, TEÂ – After catching only two passes in seven games in 2008, Haynos was used in more two tight end sets and played 51 percent of Miami’s offensive snaps in 2009.Â But while the 6’8, 270-pound TE showed flashes of future potential, he was far too inconsistent and had only three totalÂ receptions for 17Â yards in the two games that Fasano missed with a hip injury.Â Although he’s an intregral cog in the Dolphins’ offense, Haynos isn’t likely to see a significantly increased pass-catching role or threaten Fasano forÂ the starting job anytime soon, makingÂ him largely irrelevant in all but the deepest of fantasy leagues. Does the addition of Martin mean the end of the Kory Sperry Era? 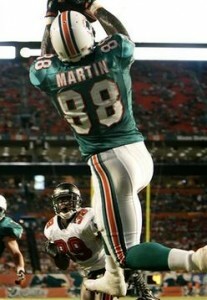 David Martin, TE -Martin, an eight-year veteran who’s familiar with the Dolphins’ system after spending two seasons in Miami, was unexpectedly re-signed last Friday.Â While he averaged 14.5 yards per catch in 2008, it’s hard to imagineÂ the 31-year-old has much left after spending last year on Injured Reserve.Â Â If he’s fully healthy, Martin would allow FasanoÂ to catch more passes by taking over someÂ blocking duties,Â and could prove to be an effective situationalÂ downfield threat.Â His signing means veryÂ little in fantasy cirticles, butÂ certainlyÂ signals the coaching staff’s unhappines with the progress ofÂ their young Tight Ends. John Nalbone / Kory Sperry, TEÂ – Both Nalbone, a fifth-round pick in 2009, and Sperry, who was signed as an undrafted free agent after attending the San Diego Chargers’ training camp, spent most of the 2009Â season on the practice squad.Â While Nalbone didn’t play a single snap in the regular season, Sperry made the most of his lone start, catching three passes for 31 yards and a TD in a win against the Tampa Bay Buccaneers.Â The more-experienced Martin likely has theÂ inside track on the third (and perhaps final) TE spot, and barring an injury, Nablone and Sperry wouldÂ only provide blocking and special teams help.